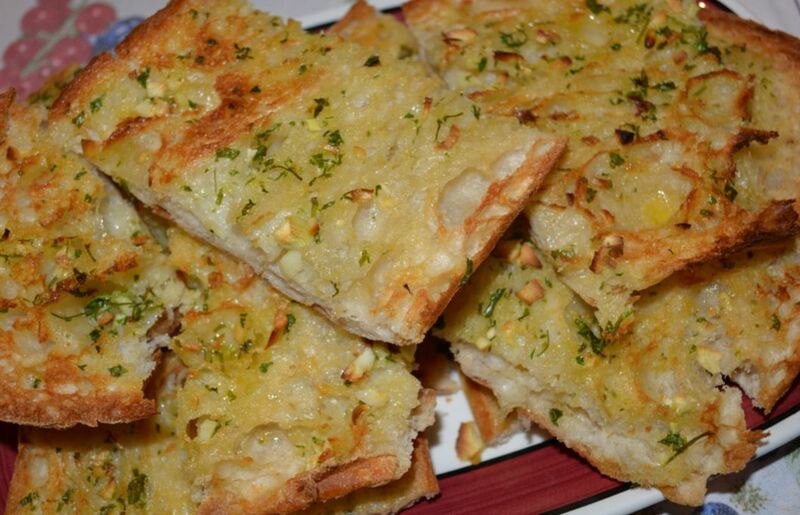 This is my favourite garlic bread recipe. After trying many different recipes, this is the one I found the best. It is so easy to make, and is so good to eat. My kids get very excited when they know garlic bread is baking. We are not a big bread eating family, rarely do we have bread with dinner, not for any health reasons, I just don't think we need it. But when we do have it with dinner, it is because there isn't really enough protein on offer, so I need a filler as the kids (and husband) will be hungry if there isn't one. This is where garlic bread works in our house. An example, I made Piri Piri Chicken the other day, using a 1.5kg chicken. When I put the chicken on the table my husband was like this is not going to be enough. But once I added the green salad and garlic bread, it was enough and it was lovely. The first time I made this I put on all the butter the recipe said to, I thought it was too much, but I am one of those people that follow recipes the first time I try things, and I was right, there was butter overload it was so oily it was unpleasant. So I have reduced the butter amount by a lot as I prefer there to be just enough butter to be classified as garlic bread, but I want the bread to still be white underneath. My preferred herb is parsley here, but use whatever you like. My preferred bread is the baguette, but if I have the turkish loaf at home, I will use that to. If you want to reduce the amount of garlic butter used even more, wrap what is leftover up in cling film and freeze it for a later use. Preheat the oven to 220C/200C fan forced. Line a large baking tray with baking paper. Combine the butter, garlic and herbs in a bowl, season with salt and pepper, using a fork mix it all together well. If using a Turkish Loaf: Split the Turkish Loaf in half horizontally. Place on your baking tray cut side up. Spread the butter evenly on both halves, don't add too much butter, it will over take the bread and you will get an oily mess. Bake, buttered side up for 8-10 minutes or until the butter has melted and the edges have become golden, you want a bit of crunch. If I want to quicken things up, if after the 10 minutes the edges are not golden, I turn the oven to the fan grill setting, then I grill the bread until the edges are golden, but if you do this, keep watching it as it goes from golden to burnt very quickly. For a French Baguette: Cut bread into 2.5cm thick slices without cutting all the way through. With a knife place 1-1.5 teaspoons of butter into each slice you made. Wrap the loaf in aluminium foil. Bake for 12-15 minutes or until the butter has melted and the bread is crisp.